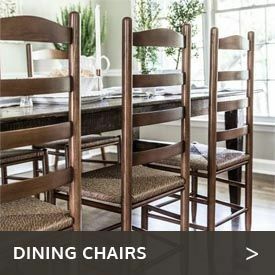 If you want to invite everyone to enjoy the beauty of your home’s exterior environment, the Western red cedar wood outdoor benches available from Cedarwood Furniture offer plenty of attractive and comfortable ways to seat a crowd. 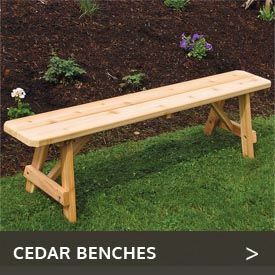 In addition to cedar’s natural beauty, these benches will serve you for many years, thanks to cedar’s natural oils that help it fend off insects and the weather. Our cedar benches are available in a multitude of styles and sizes, giving you the ability to use them practically anywhere. Choose from sizes ranging from 2 feet to 8 feet. Select backless benches or backed benches with or without arms. Suit your own taste and style with designs ranging from the simple and rustic to the more formal and urbane. 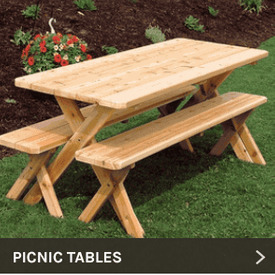 You will find benches here perfect for picnics, gardens, parties and a host of other uses. We even carry cedar benches specifically designed for lounging in saunas or sitting under your favorite tree.